As you probably know by now if you’re following along at home, I’m a waitress. The interesting thing about being a waitress is that it’s not interesting at all. I come home from my work and want to talk about my day, but there’s not much to tell, really. I could relate a few gossipy stories about my co-workers, and I could tell endless stories about how perplexingly rude people can be, but nobody wants to hear that. So why am I talking about it now? Well, I just thought you’d want to hear about everybody I waited on yesterday, and exactly what they ordered. Settle in, it’ll be a long list! I’m kidding, of course, but the truth of the matter is that waiting tables can be quite poignant sometimes. As a server, you’re addressing a very basic human need, you’re watching people eat and interact with each other, and depending on your mood, people can seem wonderful, foolish, or even vaguely disheartening. Sometimes the smallest gesture can seem so beautiful and sweet. Yesterday I waited on a woman and her nearly grown son, just the two of them. I’d like to think I’ll go out with my sons someday. (And the boy paid, which, undoubtedly my boys will be doing, because I’m just a waitress, for chrissake, it’s not like I’m actually saving any money!! Waitressing – the cash will be gone in under a week, but the anxiety dreams last a lifetime!!) The mother left the table for a spell, and the boy sat at the table alone. He was quite a tall person, and he had a tiny tube of lip balm, which he applied with slight, sweet self-consciousness. And then sat and read the miniscule writing on the tube, waiting for his mother. It sounds silly, I know, but I found it moving. I wondered what this pair were doing, out and about, before they stopped for lunch. A lot of people are looking for attention when they go out to eat, which is why they complain, and tut and fuss, and send food back. One fellow who comes in nearly every week likes to talk to everybody sitting around him. If nobody will talk to him, he talks very loudly to his wife, holding forth on one subject or another, seemingly waiting for somebody to jump in and give him a bit of argument. Yesterday he spoke in his carrying voice on the subject of nuts. You can have a whole bag of nuts, he declared, and every once in a while, one of them is rancid. And you can never tell which one is rancid, but one rancid nut will put you off all nuts for a while. Isn’t it the truth, I thought. If there’s one thing waiting tables has taught me it’s that we’re all nuts. Everybody is crazy. The world is a big bag of nuts, and sometimes you get a rancid one, but mostly they’re sweet enough. Speaking of sweet!! This bread is loosely modeled on yet another recipe from Mrs. Beeton’s tome of everyday cookery. 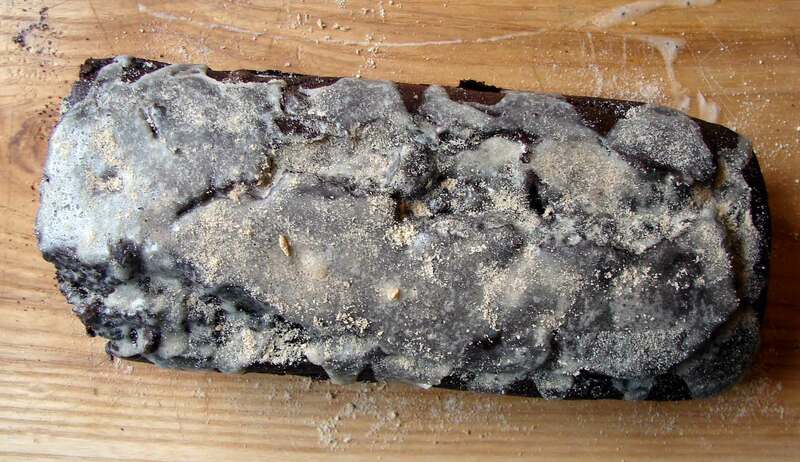 Her recipe was for a malt bread. I love malt powder, and for some reason it reminded me of hot chocolate mix I used to love as a child, which had cocoa powder and malt powder and cinnamon. A lovely combination! The bread is not too sweet, (which is why I can get away with calling it bread and not cake!) and I think this helps you to notice the taste of the cocoa, rather than just a sort of sweet chocolatey flavor. It does have chocolate chips and a sugary cream glaze (which is supposed to be like the whipped cream in your hot chocolate, of course), though, so who am I kidding? It’s a cake. Waitress comes over, nobody in the place but me and her. I love Time out of Mind! As a bonus track you get Standing in the Doorway, cause I can’t stop listening to it. Preheat the oven to 375. Lightly butter a bread pan. In a medium-sized saucepan over medium heat, combine the butter, golden syrup and sugar. When the butter is just melted, transfer them all to a large bowl. Let cool a minute or two, and then beat in the vanilla and two eggs, one at a time. Add all of the dry ingredients and mix well, and then stir in the chocolate chips and milk. Spread the batter in the loaf pan and bake for about an hour, till it’s firm to the touch, and a knife inserted in the center comes out clean. De-pan, and let cool for a few minutes. Meanwhile, cream together the butter, icing sugar, vanilla and cream until nice and smooth. Drizzle this over the warm cake, allowing it to drip down the sides. If you like, top with a dusting of malt powder and cinnamon. 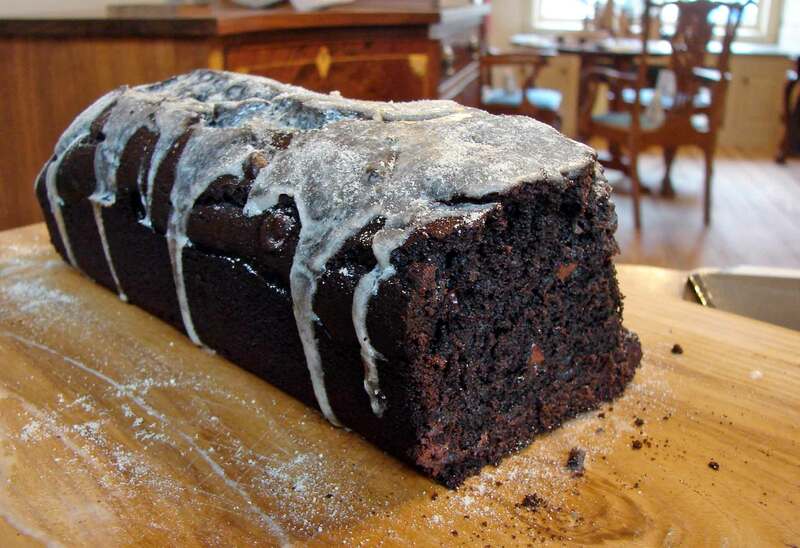 This entry was posted in bread, cake, chocolate and tagged Chocolate quick bread, malt bread, spicy cocoa cake by Claire. Bookmark the permalink. Sounds delicious! I bet a pinch of cayenne pepper would taste good in that too. steenbeck, I love you. Did you know? It’s mutual! Mutually assured affection!! Nice thoughts, lyrics and waitressing survival strategy. Recipe looks good too ! What is Golden Syrup and Malt powder? Is malt powder chocolate powder for making hot chocolate? I live in California, and not use to hearing those ingredients as you listed them. BTW we have every single song that Bob Dylan ever sang, and have seen him several times in concert. What a writer he is. Thanks for sharing your love of Dylan. But mostly about your work as a waitress. I can’t even imagine dealing with hungry people all day long. I would make a horrible waitress, getting all the orders messed up. What kind of place do you work at? Golden syrup is … well, it’s hard to describe! It looks like honey, but it’s thicker and has a malty flavor. Ah, here it is…it’s like pale molasses. I first encountered it when I lived in England as a child, but it’s available in my ordinary grocery store, now. If you can’t find it, I think it would work just to use another 1/4 cup of brown sugar. And malt powder is malted milk powder…carnation makes it, and I think horlicks is malted milk powder. Definitely available in an ordinary grocery store (around here, anyway!) It would probably be with the hot drinks. If you can’t find it you could just leave it out, though. The restaurant I work at is as close as we come to having a local pub. It’s in a really nice old building with a big wooden bar and a fireplace. And that’s all I’ll say about it in case my boss reads this at any point! And yes, Dylan is a genius. I came quite late to Time out of Mind and Love and Theft, and now I can’t get enough of them! They feel so honest and sort of lonely, but there’s a lot of humor in there, too.